First, let me remind you what my bead soup blog partner Patty at My Life Under the Bus sent me. And, I crafted a pair of earrings! AND. . .there's still more left in the soup pot. Patty really did spoil me. 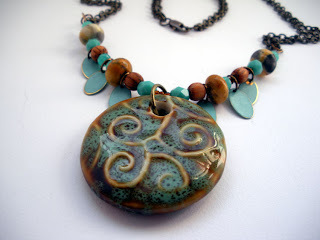 A BIG THANK YOU goes to Lori Anderson at Pretty Things for Hosting the Bead Soup Blog Party. She went through a ton to organize this many bead bloggers. She's an angel for doing it! Oh my...be still my heart! I love the first necklace--I could absolutely see them with the earrings. But I also love the second necklace. Beautiful pieces of absolutely delightful talent and creativity! So Nice! Such incredible wire work and love how you put those delicious unique elements together. Very lovely pieces! goodness gracious, what a lovely soup to work with! you made some really beautiful pieces! I love everything that you did for this blog party! Just amazing! All three creations are gorgeous! You did a great job with your soup! Oooo you had some wonderful bead soup to work with. You certainly made some fantastic jewelry with it! I love the wire wrapped earring circles!! Patty sent you such a wonderful soup, and you totally did it justice with thiese pieces!! The blend of colors in each piece really works, and you added lots of unique touches to make them special. Beautiful work! I love them all but oh yes, that second necklace? Perfect. LOVE it! And I really like how you incorporated wire in your earrings. Very clever! I hope to see you again in August! I like it. Very interesting and very beautiful! 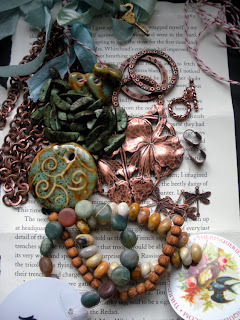 I can see how you'd jump on that copper focal right away...it's fabulous and the beads you mixed with it are perfect! I really like what you have made, especialy the earrings! Those are very pretty! I love the first necklace, the second one is nice too. Very creative. Great job on all three pieces. I think I would want to keep them all. That is wonderful soup!! I would like a serving of that please! everything is wonderful!! And that focal...wow!! You did a great job bringing it all together! Hi Hope, I am crazy for the beautiful first piece -- copper is so warm and elegant. Very art nouveau-ish. Both pieces so different. Isn't the swop hop fun? So much beady goodness! Love it all! What a beautiful and unique piece. All I can say is WOW! Your soup was tremendous and your pieces are fabulous. I have to say, the second one really called to me. I can see why you are keeping it. The way those turqoise teardrop fan toward the focal is just perfect. Ok, you had me at the soup..I love the bead soup mix you received. You did a great job with it. Very pretty. all three pieces are quite lovely! Nice! Beautiful pieces. I love those earrings! WOW!!! You sure outdid yourself with not one but TWO beautiful necklaces! And I agree with LeAnn, I'd keep them both! Enjoyed seeing your Bead Soup creations...and the earrings are so pretty too....love that wire wrapped detail you added! I love both necklaces. In the first one, they play of light and dark beads around the chain is really interesting. 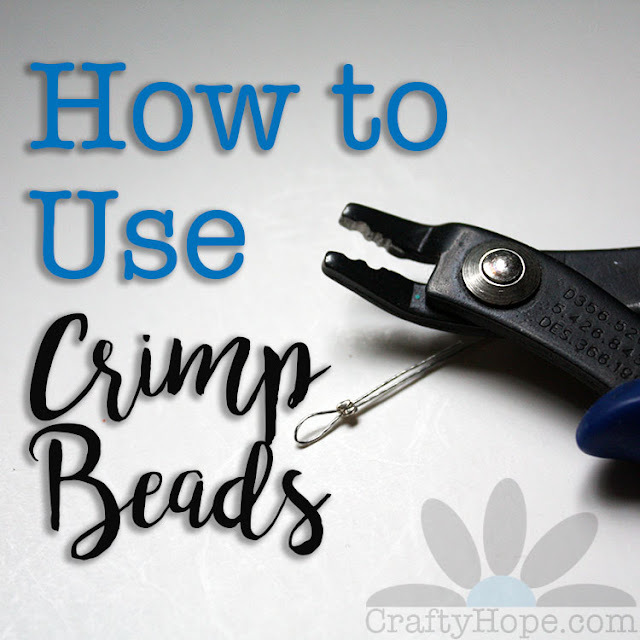 In the second, I love the little dangles with the firepolished beads. They really make the earthy focal pop. Bravo! I'm crazy for copper. Excellent job. Oh yes you were spoiled but so are we for getting to see your beautiful creations! They are all wonderful but I'm in love with your dragonfly earrings! Wow! Your work is gorgeous!!! You did a wonderful job with your soup beads. Cheers! Wow, 2 necklaces and a pair of earrings. Awesome and beautiful. 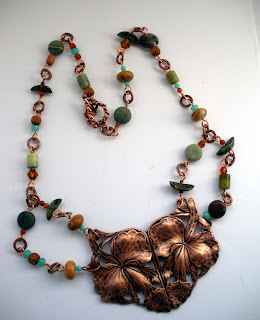 I love the first necklace the copper focal is wonderful. Wow! What a stash. 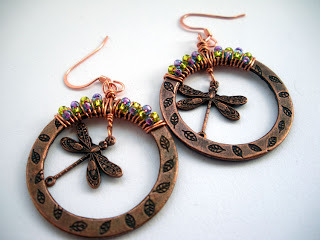 I do love those dragonfly earrings. So fun! Wow. What great pieces. I really like the art deco focal of the first piece, it really makes a statement and grabs your attention. Your color combinations are beautiful and I love the pop of turquoise. Nice job! You hit the jack pot with your soup! I love both necklaces! Each has a different look but I love the colors & textures of each of them. Hard to decide which is my favorite! Love the necklaces!!! The way you used the pendant and the 2 strands off of it, my fav. You cook up a mean batch of soup! These are just crazy cool!! Wow! Dang girl, you were busy! I love all the pieces you've created. They've got a very warm and earthy glow and they are tres chic! Good job! Oh such beautiful focal pieces, I love how you put it together, gorgeous. Beautiful, Hope! You made some really lovely pieces here with Patty's gorgeous soup. I would keep that necklace for myself if I were you too! Those earrings are DARLING! I love how did the beaded wire wrapping at the top of the rings. What a beautiful stash of bead soup, and you did a fantastic job with all the pieces. I love the dragonfly earrings. Those are some fantastic pieces! Totally wearable, and just lovin' those earrings! Great job. You made three stunningly beautiful pieces, and congrats on keeping one for yourself. After making all that soup you deserve something special. In love with necklace 2. It has everything I desire in a piece. Colors of earth and sea, texture, and flow!!!!!!! Amazing! Love what you did with the first necklace and focal. Such a great mix of beads. I love the necklaces and the wire wrapped earrings, great job! I really love the colour combination you've used in your piece - Hmmm, really nice! You got a great soup, and I love hat you did with it! Both necklaces are beautiful, I definately would keep that second one for myself also, great job! You certainly had a great mix to choose from! I really like each piece. The double strand near the focal on the first piece is just great, super idea! Your Partner sent you wonderful beeads!! Love love love the top Necklace with that gorgeous focal. Just beautiful!!! Nice earrings. Youve done a wonderful Soup I think. Still making my way around to everyone today. I love the tones in your pieces. Both focals are gorgeous and your designs showcase them beautifully! They both turned out very pretty. But I love that first one with the big copper focal. Copper is my favorite metal, so it especially speaks to me. Nice job. Nice pieces and since i'm late making the rounds, I also appreciate reading the back story.I'd really like to see that fist necklace on the body or a mannequin. Love to see how it hangs with that double attachment. I love your multi-bead links on your 1st necklace. Very nice use of mixed sizes and shapes. Both pieces are fabulous! OMG, that huge pendant in the first necklace is lucious! Love the colors in the second piece. All the pieces are nice, but I agree with you, the second one is my favorite too. Oh, you made beautiful necklaces! Love the seed bead accents on the earrings! 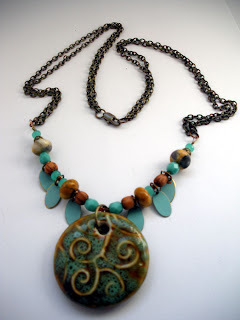 They're all lovely, but I think it's the second piece that really caught my eyes with the sweet turquoise dangles. I really like the colours in the first necklace too. Very pretty! Fabulous BEAD SOUP Friend!!! I love what you designed with all your components... Beautiful work!Can I just say "YUMMMMMMMMMMY!" Thanks for sharing your creativity!! Love all of your pieces, but I really like the earrings! VERY nice - we received similar color palettes - nothing I've worked with before but am really enjoying it! Oh what beautiful pieces! Both the necklaces are so pretty and I am glad that you are keeping one. And the dragonfly earrings are amazing. Great work! I just want to say thanks to all of y'all for the support and encouragement. I'm so glad you liked my pieces. 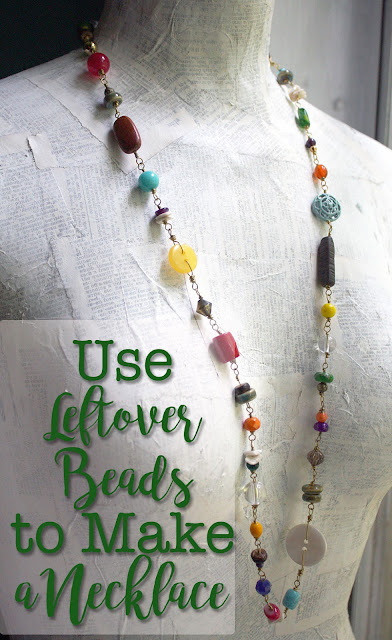 This bead soup blog hop had been A BLAST. Thanks! p.s. I did a post on Tuesday that goes into more detail about the pieces I made if you are interested. Beautiful work....love what you did! I enjoy reading your blog. Also, thank you for stopping by my blog and commenting. So nice of you! What beautiful necklaces, and the earrings...simply gorgeous. Great designs, well done! Ohhhh how delicious is your soup! That copper focal it stunning. I love what you have created. 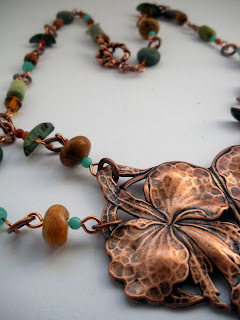 I love the first piece first... the copper focal with the darker beads is just so striking. Well done! Really beautiful mix you received! Your pieces are wonderful. I love how you wrapped the hoops on the earrings - looks so cool! I love what you've done with your soup! The necklace with copper focal is amazing! Great job! I love what you did with your soup goodies - the necklace with the large floral pendant is stunning! Both pieces were so well done and lovely but I have to say I like the ceramic focal one the best!